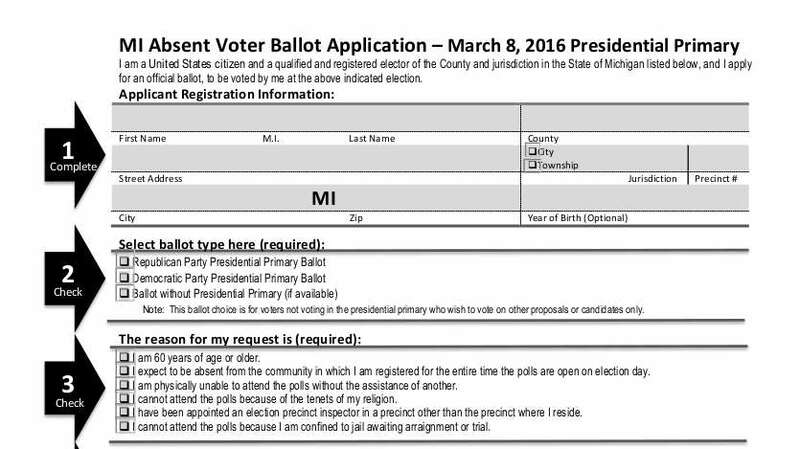 The standard form required to request an absentee ballot in the upcoming March 8th Michigan presidential primary is now available online as a .pdf file here. The large print version of the application for the visually impaired as a .pdf is here. Completing and filing this application also gets you the ballot(s) for any local candidates and/or issues also voted on in March. Note that you have to designate your political party preference on this request form to receive the presidential primary ballot you wish to vote. A neat way to get you into someone’s big data file. Just download this application form, fill it out, and mail it to your clerk. Completed applications which request an absentee ballot be mailed to you must be received by your clerk no later than 2:00 PM on Saturday, 05 March. However, this is cutting things awful close. You will receive your absentee ballot in the return mail, but bear in mind that U.S. Postal Service First Class mail is running slow in the age of Obama. Late absentee ballots are not counted and this has become a significant issue as of late. You will probably have to mail your ballot by Thursday, 03 March to be assured that your clerk receives your ballot by election day. You can always hand deliver (or have a friend deliver) an absentee ballot to your clerk before the polls close on election day.